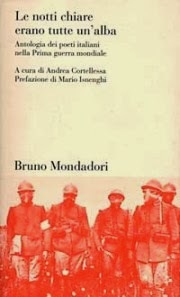 The one that follows is a good opportunity to deepen the knowledge of Italian fiction of the Great War. We have the pleasure to post an interview with Giovanni Capecchi, professor of Italian Literature at University for Foreigners in Perugia. He recently wrote a book entitled Lo straniero nemico e fratello. Letteratura italiana e Grande Guerra (The Stranger as Enemy and Brother. Italian Literature and the Great War, published by Clueb, the cover is beside). This study is going to become a starting point for future researches about the fiction written during or after the First World War. We wish to thank professor Capecchi once again for his time and the answers below. Would you suggest fiction or poetry for a better understanding of the Great War in Italy? There are very important poems which can help us understanding some aspects of the Great War. Take for example Ungaretti’s Il porto sepolto or, moving to England, Owen’s compositions. Nevertheless, I really think that works of prose remain the best handhold to understand that war and I mean both novels that originate from the immediate trenches experience (think about Un anno sull’altipiano by Emilio Lussu, - translated with the title of A Year on the High Plateau – which appeared 1938 (the cover of one of the several editions is beside) and yet one of the most important work on the topic) and diaries or memoirs. 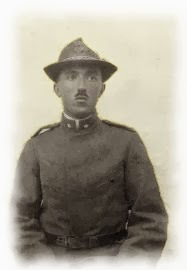 Not so renowned, but extraordinary works are Trincee (Trenches) by Carlo Salsa and Diario di un imboscato (Diary of a Draft Dodger) by Attilio Frescura. Why did you decide to work at this introduction to the Italian literature on the Great War? Did you look at other similar anthologies - in Italy and especially abroad - to organize the material? If not, can you describe your working method? The answer could be very long. I try to summarize it. What I personally like is when you can record a sort of friction between literature and history: during some crucial periods writers were able to narrate “live” better than historians or journalists did. In Italy this is exemplified by authors like Verga, De Roberto or Pirandello after the process of national reunification or like Bianciardi, Calvino, Ottieri, Volponi, Pasolini or Testori during and after the economical boom of the Sixties. The First World War was really a break between all what was before and what happened after. The Italian poets, a part from few exceptions, wanted the war for very different reasons. They went to the front and fought the war in the trenches. 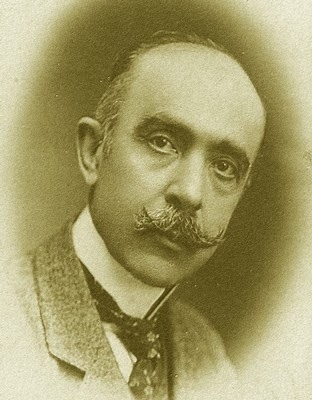 Except the cases of those poets who kept on celebrating the war as a welcomed event (among others Marinetti or d’Annunzio), most of them described a war that was very different from the one they had expected or even wished: the muddy motionless war of the trenches, of “moles” rather than of heroic fight on the open battlefield, the long war instead of the “blitzkrieg”, against a – mostly invisible – enemy. This does not mean that at the end they disavow the war, but for sure they started depicting the war as it really was, giving up the bombast of the first days. Actually their narration of the war was also a way to tell the human life, dominated by the shadow of death. I spent some years reading literary texts and essays about the First World War. 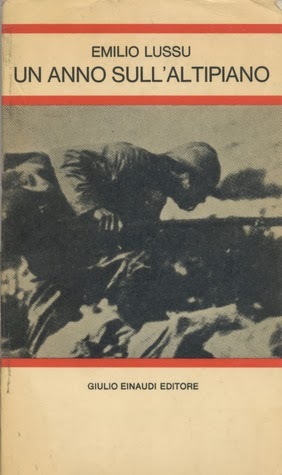 Reference books were those of Mario Isnenghi and, for Italian poetry, the anthology edited by Andrea Cortellessa (see cover beside this answer: the book edited by Andrea Cortellessa is probably the best anthology of Italian Great War poetry today available). But also the works of Fulvio Senardi, Fabio Todero, Marino Biondi and Franco Contorbia were important as well. Anyway, what eventually came out was that a study on Italian fiction about WWI was still missing in the panorama. I tried to fill the gap, trying to offer a book especially useful for the students. 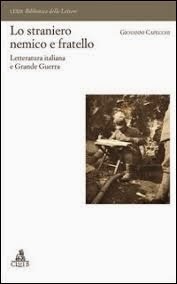 Among the wide literary output related to World War I, is it possible to identify at least few general "mainstreams" or "specific features", which characterize the work of Italian writers of the period? Or are we forced to deal with a sort of kaleidoscope of single point of views and personal experiences? The relationship could be described in this simple statement: each author has his personal war experience. Sometimes we are not allowed to considers their works as a reliable representation of the war - consider for example Carlo Emilio Gadda’s diary, Diario di guerra e di prigionia (see Gadda beside in the picture), that is rather the story of his neurosis. Anyway, some themes are recurring and above all the dramatic difference between the war they had imaged and the war they really lived. Other important themes are the journey toward the front (the railway stations, for example, and the discovery of the front) as well as the idea that the heroism of soldiers was not to be found in hating the enemies or in longing for bloody battles but in the capability of keeping one’s own place even despite the fear, and also the constant presence of death (for many of them “a question of centimetres”). Writing as a therapeutic process, as a form of elaboration of traumas. How does this statement fit with the narrative of the Great War? It goes without saying that narrating the war is an attempt to elaborate the trauma. But there’s an important point that has to be stressed. For many of these writers the war became the most important moment of their life or, like Giovanni Comisso wrote using a mathematical image, “the square root of life”. After what they experienced in the trenches, their life after 1918 cannot but be “mediocre”. And of course we cannot forget that the war gives evidence to the vulnerability of human life and its transience. Writing about the war means writing about the life itself. Does the stylistic genre (diary, fiction, biographic report) adopted by the single authors affect the interpretation of the war? Very interesting question. Each writer has its own opinion about the war and this opinion is not given once for all. This idea of war is destined to change in the years. But what I can say is that the idea of war emerges from what they wrote with a power that is somehow related to the form they chose (poetry, fiction, diary). Poetry of course drives to synthesis, a novel or a short story allow to dilute the vision of things thanks to their literary filters. Diaries or notepads register the first impressions without the time meditation that often exists between actions and the description that comes after. What about the interconnection between authors, works and nations? Is it possible to look at the narrative of the Great War as a meta-discourse, as a collective work of interpretation, elaboration and remembering the war beyond the national divisions? From this point of view, does the category of "enemy" always work? The category of “enemy” was the starting focus of my researches. I believe that what I demonstrate is a kind of evolution of the image of the enemy in soldiers’ minds. Before the war, the intervention propaganda depicted the enemy as a monster; in the trenches, during a first phase, we have the “invisible enemy” that soldiers kill without hesitation or afterthoughts. It’s when the enemy is under sight that soldiers see a neighbor and a brother who - like everybody - longs to come back home, thinks about kin and does not love the war. This represents a recurring topic that many authors describe and it’s also an attempt to detect a spark of humanity in the inhumanity of war. And we don’t have to forget that the feeling of brotherhood among combatants is in contrast with the distance between soldier and officials in the trenches on the one hand, and between them and the general headquarters – which were far away and out of danger – on the other hand: these latter, notwithstanding they were compatriots, became the real “enemy”. On a worldwide level, which are the top three novels of the Great War according to your reading experience? Un anno sull’altipiano by Emilio Lussu, Le feu by Henri Barbuse and Im Westen nichts Neues by Eric Maria Remarque. These are three novels where the autobiographic element is the key. 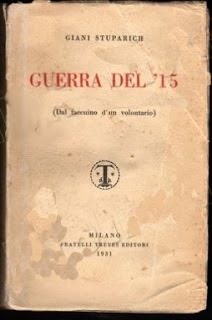 Any suggestion about World War I novels that could be translated into Italian or on unknown Italian World War I Novels that could be "exported"? I stay on the second part of your question: Vent’anni by Corrado Alvaro is not known outside Italy and I think it could be interesting to translate it. In addition to this, Trincee by Carlo Salsa and Guerra del ‘15 by Giani Stuparich (see cover beside) could be promoted at an international level. And again La paura by Federico De Roberto, a short story that was translated into French. La paura is a great short story, written under the influence of a strong realism by a writer who did not take part in the war. This is an aspect that needs to be considered: we do not have only soldiers narrating the war, but also stories from behind the lines, from the military hospitals, from the offices (think about Aldo Palazzeschi, who, in Rome, still lives and suffers the war as a trauma). The distance from the front did not prevent Federico De Roberto from writing a masterpiece like La paura. If you were forced to make a choice, which books would you suggest to approach the Italian narrative of the Great War? Let's say four books to recommend to our readers. I know I repeat myself but this is my list: Un anno sull’altipiano by Lussu, Trincee by Carlo Salsa, Il porto sepolto by Ungaretti and La paura by De Roberto (beside in the image). These four books represent four different forms and namely the autobiographic novel, the diary, the book of poetry and the short story but also four books born in different time and space. Ungaretti and his “live poetry”, Salsa and the process of writing after coming back home starting from the notes taken during the conflict, Lussu and the late publishing of Un anno sull’altipiano in 1938, to keep distance from Fascist rhetoric and to demonstrate that the topic of First World War endures twenty years later, and finally De Roberto that, as we said, wrote a masterpiece far from the front.